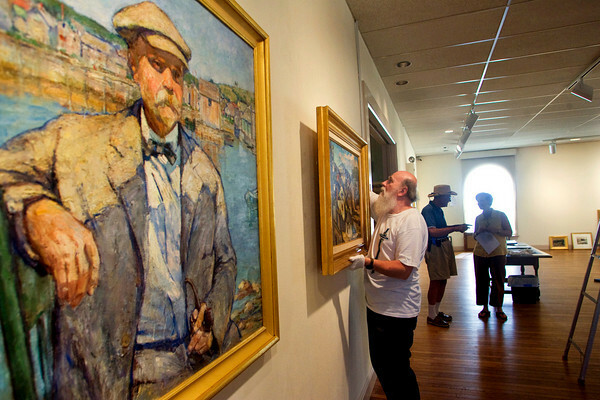 Gloucester: Facilities manager Paul Miller hangs a painting by Rockport artist Herbert Barnett for the show Art is Long, Life is short: Rockport Artists in the 1930s at the Cape Ann Museum Thursday morning. Pictured right is local art collector Bill Trayes and Cape Ann Museum Director Ronda Faloon. Pictured left a portrait of C.S. Kaelin by Agnes Richmond. Mary Muckenhoupt/Gloucester Daily Times.